Community entry is a process of initiating, nurturing and sustaining a desirable relationship with community with the purpose of securing and sustaining the community’s interest, gain support from the community leaders and to ensure establishment of good working relationship in all aspect of a programme. The engagement of community to bring about mobilization and participation is a follow-up activity to community entry. Meeting with some community members to inform and them about the project and to solicit their views on the project. 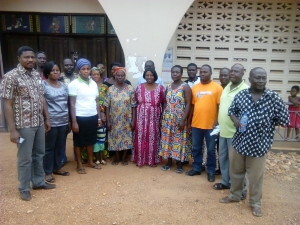 On 14th August 2015 the team (T-GroUP Ghana team and Mr. Forabbe Ayer from Ghanata Secondary School-a Project partner) met two chiefs; the chiefs of Aperkon and Salem communities. The objective was to recognize the position and roles of the community leaders in order to gain their support and to facilitate the engagement process. It was also to develop ways in seeking their cooperation and support for the project. Asked for a contact person to represent the chief at the community meeting scheduled to take place on the 21st August 2015. 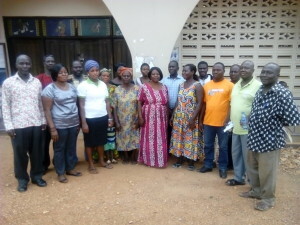 In all three chiefs (Aperkon, Salem and Wedekum) and representatives of two other chiefs from the Dodowa area were met. At each meeting GhC 50 was presented to each chief, this was done on behalf of the team by Mr. Forabbe Ayer. 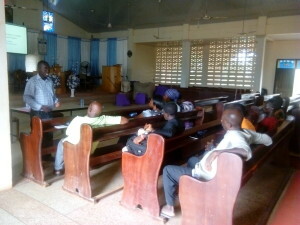 After chiefs were met, another meeting with stakeholders/community members was arranged and held on August 21, 2015 at the Presbyterian Church in Dodowa. The objective was to inform community members/ identified stakeholders about the project and to solicit their views on the project. It was also to begin the process of community engagement in the research project. ants are Christians, the meeting was started with a Christian prayer at 10:45 am by Mr. Forabbe Ayer who was a participant and also acted the role of an interpreter. The prayer was followed by introduction by the interpreter in two local languages; the researchers were introduced and a brief on our mission was given. Participants introduced themselves after. In all twenty (20) members from Dodowa attended the meeting. The team leader (Dr. George Lutterodt) explained the objective of the project, the possible benefits to the people and also stressed on the fact that the project is more of a scientific research and not a water supply project, the kind of equipment community members should expect to see during the Project and their functions was also explained, George spoke in both English interspersed with the local language. After introduction and explanation of the T-GroUP project which lasted for 20 minutes George continued with a presentation, the content of the presentation was more to explain the functions of each equipment (Geophysics equipment, Water Quality Electrodes, Drilling rig etc.) to be used in the field. To allay their fears, photos of a field work conducted in Kampala, Uganda were shown in the slides to inform community members that this kind of Research/Project has been conducted before (presentation slides are attached). Community members present welcome the research and said they cherish it so much. To them it will help them to known the quality of the water and sickness associated it the level of quality. Discussion was facilitated by Dr. Sampson Oduro-Kwarteng (Sampson) facilitated discussion session. During discussion the following questions were raised by the participants. Where will the boreholes be drilled? Will the boreholes be given to the community after the research? Why are we going to drill shallow wells but not only deep wells? Are we going to drill boreholes in each of the four communities in Dodowa? What will the project team do if we find out from the research that the water quality is not good? How to we inform the community about the research processes? Are some participants willing to be focal persons to be contacted to be present during ERT and drilling? How is water point managed or is there a committee responsible for managing the water points? How many Water and Sanitation Management Committees (WSMC) exist? There was suggestion that if we deal with individuals land owners of the drilling sites, the land owners will take over the ownership of the boreholes instead of the community. It was suggested that the Assemblymen and chiefs be informed of selected sites for the drilling, so that they will help with the negotiations and land acquisition for the drilling. It was said that Water and Sanitation Management Committees (WSMC) are responsible for maintenance and management of the water points. So if the boreholes are given to the WSMC, after the research, then they will manage on behalf of the community it if a pump is place on it. Some of the communities do not have WSMC in place. This means that the committee need to be formed by the Municipal Authority, in places where the committee is absent. The hand dug wells are not managed by WSMC. They are free for people to fetch since they think there is no maintenance or repairs done on them. But each existing borehole is managed by each WSMC. The membership for the WSMC is five people. The Municipal Authority knows of land belonging to government which can be sites for drilling boreholes. ERT can be done and drilling done at the location where there will be no land owner problems. It was suggested that we use community information centre to inform the people abort the project. It was suggested that we see the opinion leaders any time the ERT and drilling team come to do any work in the communities. Closing prayer was said by one participant. Each participant received a token for transport (List of participants their work place, contact phone numbers and amount of money in Ghana Cedis received is attached). Snacks were served at the end of the meeting, a group photograph was taken and the meeting closed at about 12: 45 pm.